Laughing Bear writes: "There is another comment period however and the Friends of Juniper Flats as well as interested individuals can let the BLM know how they feel about this officially." Please be advised that BLM receptivity to comments has been limited to those who have expressed interest by submitting previous comments during the WEMO planning effort. In the current BLM route recommendations, Moss Mill Rd. was addressed and a 17 year occupancy trespass was included as a reason for closing it. The recommendation goes on to state that "since the road that remained on public land had no further utility and was not consistent with management goals for the area, the road was fenced at the south end and has since overgrown." Such was the un-contested demise of a historic route acquired in a land-exchange and designated in 1993 as part of the current emergency route network. In that network, Moss Mill Rd. was specified as providing connectivity to Forest Service. However, that function is now recommended to be replaced by J1299 as a favor to a local property owner and OHV enthusiast. There has been surprising support in this Forum for this replacement by persons who formerly opposed the Moss Mill Rd. closure. Having apparently lost interest in that issue, they failed to voice their objections in WEMO and are consequently locked out of the current opportunity for public comment. 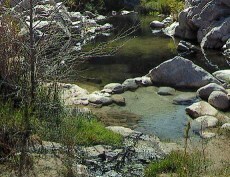 In gratitude for their support, perhaps their favored OHV friend will not only invite them to sit in "their" living room, he may also loan them his dirt bike for a spin down J1299 to view a formerly tranquil oasis.